The 1916 Philadelphia A’s probably weren’t the worst team ever. The 2008 Detroit Lions ended the season 0-16, one of many NFL teams that have suffered through a winless autumn. Philadelphia’s 76ers, meanwhile, dribbled their way to a 9-73 NBA horror show in 1972-73. In the NHL, the 1974-75 Washington Capitals skated, and slipped, to an 8-67-5 mark. So, the competition for worst sports team ever is awfully tough. But, the ’16 A’s were pretty bad. In fact, they were worse than bad. They were pathetic. That’s what some people called them. The Pathetics. Just two seasons removed from winning the American League pennant and three years removed from celebrating a World Series title, the Philadelphia A’s of 1916 took a beating. By time it was all over, and it had to be a long wait for players and fans, this Connie Mack-led squad finished 36-117, 54 ½ games out of first place. And, get this … 40 games behind the next feeblest team in the A.L., the Washington Senators. Philadelphia scored 447 runs in 153 games, or 87 fewer runs than the second-weakest offensive collection, the Senators. The A’s finished last or next-to-last in hits, doubles, RBI, stolen bases, batting average, on-base percentage and total bases. Pitchers Jack Nabors and Tom Sheehan finished a combined 2-36. Shortstop Whitey Whitt committed a league-high 78 errors in 142 games. Oops. All told, Philadelphia led the A.L. with 314 miscues. The pitching staff didn’t help things. Philly compiled a team ERA of 3.92, nearly a run higher than the next most pitching-poor squad, the Detroit Tigers at 2.97. As a staff, the A’s walked 715 batters, 137 more than any other team. Relievers saved just three games. How did all this happen? The A’s, after all, were one of the early powerhouses of 20th century baseball. Mack, along with some business partners, founded the franchise in 1901. Over the next 13 seasons, the A’s finished first six times and earned three World Series titles. They won more than 100 games in 1910 and 1911 and 99 in 1914. Philly featured the “$100,000 infield.” That group included Stuffy McInnis (first base), Eddie Collins (second base), Jack Barry (shortstop) and Frank “Home Run” Baker (third base). Collins and Baker eventually made it into the Hall of Fame. Eddie Plank, Charles “Chief” Bender and Rube Waddell—Hall of Famers all–led the pitching staff. After losing the 1905 World Series to the New York Giants in five games, the A’s won their first Fall Classic by knocking off the Chicago Cubs in five games in 1910. Philly went back-to-back in 1911 by defeating the Giants in six. The A’s returned to the World Series in 1913. Thanks in part to seven RBI each from Baker and catcher Wally Schang, Philly beat the Giants four games to one. That brings us to 1914. Bender finished 17-3, and Baker topped the league in homers as Philly finished 99-53, 8 ½ games ahead of the second-place Boston Red Sox. The Boston Braves celebrated the National League pennant with a 94-59 won-loss mark. Jack Berry went just 1-for-14 (.071) for Philadelphia; Rube Oldring did even worse (1-for-15, .067)). The A’s hit only 172 as a team; the pitchers compiled a 3.41 ERA. (The Red Sox put up a 1.15 mark.) Boston swept the Series in four games. So, the rumors began. Was this Series played on the up and up? Some observers have insisted that the A’s, supposedly upset at Mack for being a tightwad, didn’t give it their all against a team that has since been dubbed “The Miracle Braves.” Big shots like George M. Cohan were placing heavy money against the A’s, according to Bruce Kuklick in his book To Every Thing a Season. To further gin up suspicion, Cohan and some others put down their bets by contacting Joseph “Sport” Sullivan, a Boston gambler and bookmaker implicated in the famous Black Sox scandal of 1919. The A’s settled into last place for the next seven seasons. They didn’t make it to the postseason again until 1929. Led by Mickey Cochrane, Jimmie Foxx, Al Simmons and Lefty Grove, they won two straight World Series and three consecutive pennants. Once again, Mack stood atop the baseball world. But not for long. Star ballplayers cost money, money that Mack didn’t want to spend. Another sell-off began. Al Simmons ended up with the White Sox, Cochrane with the Detroit Tigers, Foxx and Grove with the Boston Red Sox. The A’s finished in the second division for the next 14 seasons. They finished last nine times. They were pathetic again. Frank Baker swung a mighty bat. The dead-ball slugger wielded a 52-ounce piece of lumber (nearly 20 ounces heavier than the typical major-league bat used today). Just 5-feet-11 and 173 pounds, Baker took a solid rip. He credited the strong wrists he developed while working on the family farm in Maryland. Baker, born March 13, 1886, signed a pro baseball contract in 1905 for $5 a week. He tripled that figure one year later by cutting a deal with the Sparrows Point Club in Baltimore. Baker, a third baseman, hit .299 in 1908 for the Reading (Pa.) Pretzels of Class B Tri-State League. Philadelphia A’s manager and executive Connie Mack liked what he saw and bought Baker’s contract. The left-handed batter hit .305 and led the American League in triples (19) in his rookie season of 1909. He popped four home runs and drove in 85 runs. Baker’s numbers dipped across the board in 1910; he still tripled 15 times, hit .283 and drove in 74. Baker also hit .409 (9-for-22) in the World Series as the A’s beat the Chicago Cubs. Now, baseball historians call the dead-ball era the “dead-ball era” for a reason. Teams counted on stolen bases, hit-and-run players and other “small-ball” tactics to score runs. Between 1900 and 1920, the league leader in home runs hit 20 or more just four times. Thirteen times, the leader finished in single digits. Ballparks were huge (635 feet to the center-field fence at the Huntington Avenue Grounds in Boston), the ball was mushy and pitchers loaded up those mushy balls with spit, tobacco juice and anything else to make it dip and do other funny things. Some baseball people sneered at “show-off” home runs. Fans marveled at the rare sightings. That brings us back to Frank Baker. He played on the $100,000 infield with the A’s, along with first baseman Stuffy McInnis, second baseman Eddie Collins and shortstop Jack Berry. (Note: Yes, being part of a $100,000 infield in the early years of the 20th century was quite a compliment.) In 1911, Baker was as good as anyone in that quartet. Baker drove in 115 runs and batted .344. He also hit an AL-leading 11 home runs. The A’s once again made it to the World Series, this time against the New York Giants and skipper John McGraw. Always looking for an advantage, McGraw wanted to intimidate Baker. A few years before, Ty Cobb had spiked Baker while sliding into third. Mack stood up for Baker and accused Cobb of playing dirty. A photograph, though, showed that Baker had reached across the base to tag the Detroit Tigers superstar. Some people thought Baker was soft. McGraw ordered his runners to go hard into third base. Rough up this Baker guy, McGraw said. Get him off his game. The Giants tried. It didn’t work. Baker at least did not let the Giants’ antics bother him at the plate. Baker smashed a home run in the sixth inning of Game 2 as the A’s evened the Series at a game apiece. The next day, Baker belted a ninth-inning homer off the great Christy Mathewson. That round-tripper tied the game 1-1. Philly won the game 3-2 in 11 innings. The A’s celebrated their second straight World Series championship by beating the Giants in six games. The Series included a week-long rain delay. Baker hit .375 (9-for-24). He didn’t hit any more homers after those first two, but that was enough. He would be forever known as “Home Run” Baker. And, Baker did his best to live up to his new nickname. He slugged one more World Series homer, in 1913 as the A’s beat the Giants again. He also led the league in homers in 1912 (10), 1913 (12) and 1914 (nine). “Home Run” Baker retired after the 1922 season with 96 career homers. He is 870th on the all-time list, with Bernie Carbo, Rick Dempsey and a handful of other guys. Baker hit one fewer career home run than Tim McCarver. Only, Baker, though played dead-ball baseball. Look fast enough and you’ll notice an elephant figure stitched onto the left sleeve of the Oakland A’s uniform. New York Giants Manager John McGraw set this design idea in motion more than a century ago. Philadelphia A’s skipper Connie Mack smiled and said “thank you very much”—or something like that. The A’s elephant story goes back to 1901 and to the team’s first days in Philadelphia. McGraw wanted Baseball to stop skipper Mack and team owner Benjamin Shibe from buying up ballplayers fleeing the National League. The great hitter Napoleon “Nap” Lajoie, for instance, jumped from the Philadelphia Phillies to the brand-new A’s following the 1900 campaign. The A’s quickly adopted the white elephant figure as a mascot. In fact, before the start of the 1905 World Series between the A’s and Giants, Mack gave McGraw his very own stuffed elephant. McGraw, in the spirit of the occasion, accepted the gift. In 1909, the A’s began wearing an elephant logo on their pre-game sweaters. Nine years later, the elephant made it onto the A’s actual game uniforms. Retired as a mascot in 1963, the pachyderm reappeared in 1988. Known in the mid-1980s as Harry Elephante (Get it? ), the mascot now performs under the name of Stomper. And, yes, he works for peanuts. Babe Ruth led an All-Star tour of Japan and elsewhere following the 1934 season. Some of baseball’s greatest players boarded the Empress of Japan ocean liner on Oct. 20, 1934, in Vancouver, British Columbia. Babe Ruth, Lou Gehrig, Jimmie Foxx and several others were headed for Honolulu and, ultimately, to Japan to play a series of exhibition games. Connie Mack, owner-manager of the Philadelphia A’s, had organized the trip. Nearly 72 years old, he was mulling over giving up his dugout duties. Mack decided to give Ruth an audition of sorts. He asked the Babe to skipper this group of barnstorming All-Stars. If the trip went smoothly, baseball’s mightiest slugger might be managing the A’s in 1935. Japan loved Ruth. Fans yelled “Bonsai!” and asked if they could meet “the God of baseball.” The U.S. team enjoyed a ticker-tape parade in Tokyo. Ruth’s squad played 17 games in Japan (Some reports say 18. ), to sold-out crowds at Tokyo’s Meiji Stadium and Osaka’s Koshien Stadium, plus five more games in Shanghai, China, and elsewhere. 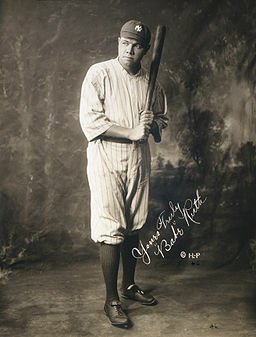 The Babe waited until the fifth game to hit a home run but slugged 13 total. The All-Stars won every game and outscored their opponents 250-45. The Japanese awarded four brass urns when the tour there ended. They were for highest batting average, longest hit, most runs driven in and best pitching. Ruth took home three urns. Lefty Gomez got the one for pitching. Ruth, 39 years old and coming off a season in which he hit just 22 home runs for the Yankees, felt invigorated by his trip to the Far East. He announced at one point that he would play baseball “until I’m 100 years old.” Mack commented that Ruth looked better at the plate than he had in at least two years. Thanks to Foxx’s camerawork, we have some footage of Ruth and the other players. Foxx recorded scenes on the ship, pre-game festivities and a little bit of game action. Robert Fitts, author of a 2012 book Bonsai Babe: Baseball, Espionage and Assassination during the 1934 Tour of Japan, sat down with Tom Shieber from the Baseball Hall of Fame to talk about the film and the expedition. Fitts said the trip had been in the making for a few years. There was only one problem. Ruth couldn’t make it. Japan was definitely the highlight of the trip for Ruth. The team went from China and then to Java and Bali. Ruth didn’t like the women in either of those two countries. He complained that they walked down the street chewing red tobacco. Ruth also didn’t care for Paris. No one knew who he was, and the people didn’t know baseball. The kids at the American School couldn’t even throw a baseball the right way. Get back to the U.S., Ruth advised them. Learn the important stuff. High culture can wait. America’s baseball legend could at least go bob sledding and skiing at St. Moritz, the French mountain resort. The Babe, ever the showman, skied while smoking a cigar. Finally, the players left for London. Ruth put on some cricket gear, couldn’t get the hang of the game, switched to a baseball stance and began pounding the ball. The Babe liked London. Ruth and the all-stars cruised into New York harbor on Feb. 20. A band played “Take Me Out to the Ball Game” as the players stepped off the ship. And Connie Mack managed the A’s for another 16 seasons. Ruth flunked the audition even as he pounded baseballs out of stadiums halfway around the world. The problem was all the other stuff. Mack didn’t like how Ruth and Gehrig barely spoke to one another throughout the ship, their long-time feud still hot. He also didn’t like how the Babe’s wife, Claire, bossed around the A’s would-be manager. That was that. Ruth, who played just one more season in the majors after his trip to Japan, never managed in the big leagues. Fitt’s book focuses on the Babe’s trip. You also can read more about Ruth’s trip to Japan, and his many other adventures, in The Big Bam: The Life and Times of Babe Ruth, by Leigh Montville, and Babe: The Legend Comes to Life, by Robert Creamer. They’re both great reads. You can read my post about the Babe and how he learned that mighty swing that produced 714 career home runs. What should we make of one George Edward Waddell, nicknamed “Rube,” born Oct. 13, 1876? 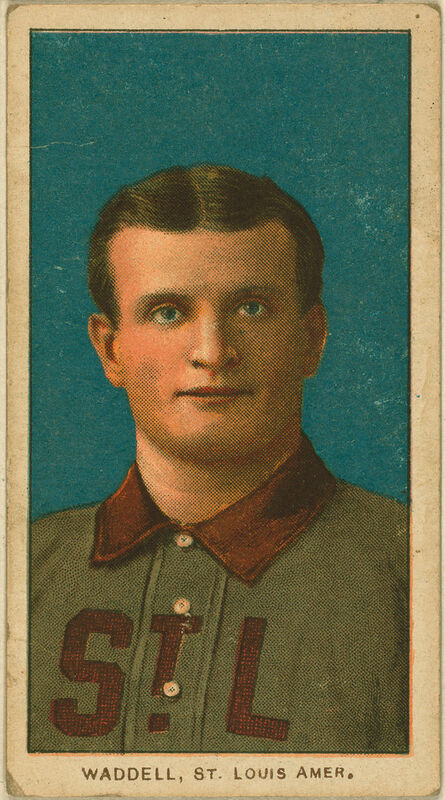 Rube Waddell went 193-143 in his Hall of Fame career. The Pennsylvania left-hander threw a blazing fastball and a tumbling curveball. He led the American League in strikeouts six times, ERA twice, and in wins and complete games once apiece. Rube fanned 349 batters in 1904, a figure no major leaguer surpassed until the Dodgers’ Sandy Koufax did in 1965. Now, baseball and booze can go together like ham and cheese. Hack Wilson liked to drink. So did Mickey Mantle. Dock Ellis went one step further. The Pirates hurler always insisted that he threw his 1970 no-hitter against the San Diego Padres while under the hazy effects of LSD. But, some say, something else was going on with Rube Waddell. They speculate that the pitcher may have been battling autism or Attention Deficit Disorder (ADD), maybe Asperger’s Syndrome. Waddell, it was said, could be easily distracted. He stared in wonder at shiny objects and puppies. Waddell broke in with the Louisville Colonels in 1897. He left in 1900 for the Pittsburgh Pirates. Early in the 1901 campaign, the Pirates dealt him to the Chicago Orphans, the forerunner of the Cubs. No one knew what to make of Waddell. The pistol-packing pitcher supposedly liked to point his firearm at the bosses. Ah, all in good fun. The Orphans, not seeing the humor, cut him loose. Soon after, Mack came calling. It was 1902, and Rube was enjoying some offseason sunshine with the Los Angeles Looloos semi-pro team. Mack talked the erratic hurler into coming east. He didn’t take any chances, though. He hired detectives to ensure Waddell’s safe passage to Philly. Rube won at least 20 games four straight years for the A’s (1902-05), including 27 in 1905. He also drove some teammates batty in the process with his aforementioned quirks. Even Mack eventually had his fill. He traded Waddell to the St. Louis Browns in 1907. Not surprisingly, Waddell couldn’t play it straight in St. Louis. Marital issues and other problems, including the heavy drinking, followed him. Even so, teammates and opponents usually found a soft spot for the hurler. Part of Waddell’s legend is that he saved as many as 13 lives. Tales of his heroic exploits grew after he rescued two men from drowning while on a duck-hunting trip. Supposedly, he liked nothing more than taking part in a good ol’ fashioned bucket brigade whenever a local house caught fire. In fact, Waddell’s death may have been due to his fondness for helping others. The story goes that his good health never returned after he stood for hours in cold water, packing sandbags along a swollen Mississippi River in 1912. Waddell contracted pneumonia, which escalated into tuberculosis. The Veteran’s Committee voted Waddell into Cooperstown in 1946.